Bellator President Scott Coker has given his thoughts on the UFC cancelling their UFC 233 pay-per-view event in January. The UFC officially cancelled their UFC 233 pay-perview event set for January 26 and Bellator President Scott Coker has given his assesment of the situation. Bellator 214 will take place on the same day and will feature a main event pitting Fedor Emelianenko against Chael Sonnen in the final of the Bellator Heavyweight Grand Prix. 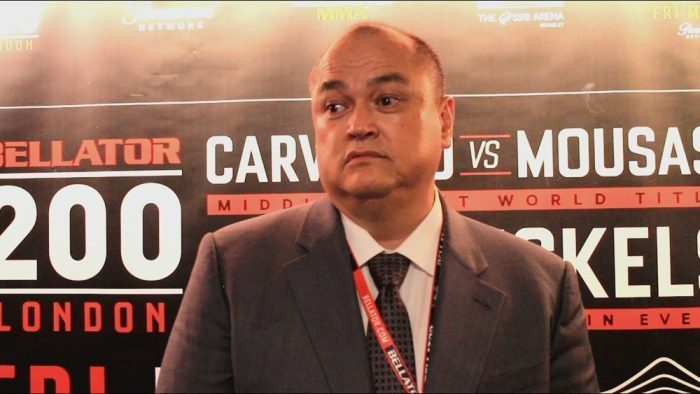 Speaking in Hawaii earlier this weekend, Coker was asked for his thoughts on the UFC cancelling their UFC 233 pay-per-view and he didn’t hold back with his assesment. Coker isn’t taking nay joy from the fact that UFC have backed down from going head-to-head that weekend. The Bellator president instead insisted that he’s just focused on running his own promotion and not being distracted by the competition. “This is not the first time, I think it’s the second, maybe even the third time on that weekend, so, you know, it is what it is,” Coker continued. “For the most part I thik we are just gonna focus on our business and just keep running it. But we have a great card on that day, with the Aaron Pico fight against Corrales, unbelievable Jack Swagger from the WWE making his debut in MMA and then Archuleta is gonna fight – we have an opponent for him. And you know Gegard and Fedor.